DETROIT: Hummer, the off-road vehicle that once epitomized America's love for hulking trucks, is now in the hands of a Chinese heavy equipment maker. General Motors Co and Sichuan Tengzhong Heavy Industrial Machinery Corp finally signed the much-anticipated deal for GM to sell the brand on Friday. Tengzhong will get an 80 percent stake in the company, while Hong Kong investor Suolang Duoji, who indirectly owns a big stake in Tengzhong through an investment company, will get 20 percent. The investors will also get Hummer's nationwide dealer network. Financial terms were not disclosed, although a person briefed on the deal said the sale price was around $150 million. The person did not want to be identified because the terms were being kept private. GM's bankruptcy filing last summer said that the brand with military roots could bring in $500 million or more. Suolang Duoji is also the controlling shareholder and chairman of Lumena Resources Corp, a Hong Kong listed mining company. GM and Tengzhong said in a statement that the transaction still must be approved by the US and Chinese governments. Chinese regulators initially expressed reservations about Tengzhong's ability to run such an enterprise. Hummer's current management team will stay with the new company, which will be headquartered either in Detroit or suburban Auburn Hills, Michigan. 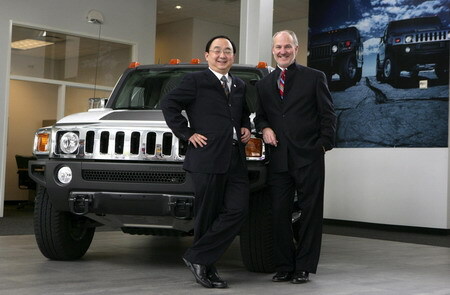 James Taylor, the GM executive who has run Hummer recently, will remain as its chief executive officer. Taylor said in an interview with The Associated Press that he knows resurrecting the brand will be difficult, but the key will be quickly rolling out more fuel-efficient models that get over 20 mpg. "I'm not in any kind of denial that we have a very steep uphill challenge in front of us," Taylor said. Hummer, he said, has been in a state "suspended animation" since June 2008 when GM announced it would be reviewed for sale or closure. Since then, its future has been uncertain and it got no marketing support or new products. Financing for leases, a big part of its luxury market, also dried up, Taylor said. Still, GM sold 1,000 Hummers in some months, proving that buyers are out there. "There's still a loyal customer base underneath there that loves Hummer," he said. Hummer hopes to keep buying fuel-efficient engines and transmissions from GM, but can seek them elsewhere, Taylor said. He said the brand has been unfairly tagged as a symbol of the American gas guzzler, saying other vehicles get worse mileage. He wants to make sure "at least we aren't a victim of misinformation that we stand alone as the ultimate bad guy in the space, which we aren't." Hummer, whose smallest model gets 16 miles per gallon (14.7 liters per 100 kilometers) in combined city and highway driving, sold well until the middle part of this decade when fuel prices began to rise. Sales peaked at 71,524 in 2006. But only 8,193 Hummers have been sold in the US through the first nine months of the year. That's down 64 percent from a year earlier. And only 426 Hummers were sold nationwide last month, according to Autodata Corp.
GM, which spent 40 days in bankruptcy protection during the summer and has received about $50 billion in US government aid, also plans to sell its Saab brand and scrap Pontiac and Saturn as it tries to streamline its operations. The Hummer deal is a victory for GM, which saw a similar agreement to sell the Saturn brand blow up at the last minute. Auto dealership magnate Roger Penske's bid fell through just before the deal was to close last week when a contract to make vehicles for Saturn was rejected by the Renault board. The company wants to focus on four core brands: Chevrolet, Cadillac, Buick and GMC. With backing from a well-capitalized company, Hummer will now focus on improved efficiency and performance and include alternative fuels, more efficient gas engines, six-speed transmissions and diesel engines. GM said its assembly plant at Shreveport, Louisiana, would continue to assemble the commercial Hummer H3 and H3T pickup trucks on a contract basis until June 2011, with a one-year option until June 2012. The military H2 version will continue to be assembled by AM General in Mishawaka, Indiana, under the same terms. South Bend, Indiana-based AM General retains ownership of the military versions of the vehicles, which have been used frequently in Afghanistan and Iraq. The Shreveport GM plant is currently slated to close by June 2012. For the time being, the plant also is assembling the Chevrolet Colorado and GMC Canyon pickup trucks. CEO Taylor said GM has agreed to make the H3 models under contract through 2012, but he expects the manufacturing relationship to end when production of other products made in Shreveport ends. "GM's not in the business of supporting other OEMs or niche manufacturers like us," he said. He sees a potential for a manufacturing relationship to continue with AM General, he said.